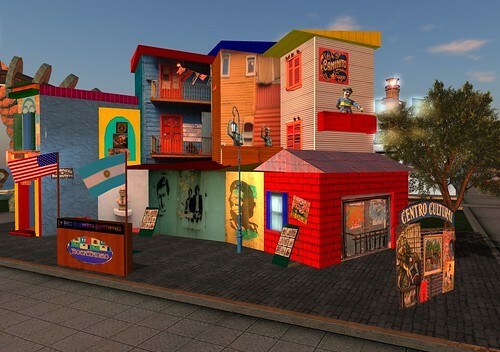 Naismith Miles built “La Boca & El Norte” on behalf of the residents of La Boca in SL. Naismith said, on his application, “I would recreate our first La Boca, a homage to the neighborhood of the same name in Buenos Aires, Argentina. La Boca started as a cultural melting-pot of immagrants, and was the birthplace of the Tango. Today it is a hip artist’s colony with colorful buildings, dancing, and artists. La Boca brings together people from all over the world, just like the real place did a century ago. Americans, Europeans and South Americans, especially from the Argentine, come together in La Boca in unexpected ways. La Boca started 3 years ago on 512M, now we have over 4000m.” This ingenious build occupies a 512 sq m plot and gifts can be found here. Find “La Boca & El Norte” on the Absurdity sim. Don’t miss the great performances at SL7b–you have a few days left. Here is Hazideon Aeon at Main Stage.